The latest newsletter is shown first, with the oldest at the bottom. Each opens in a new window when you double click on its date, provided you have Adobe Reader installed. Other documents may be placed here e.g. the full text of Society representations to planning authorities. To look for the Society's position on a particular issue, you can browse the Newsletters, starting with the most recent, looking first at page 2 of each Newsletter where its contents are listed. 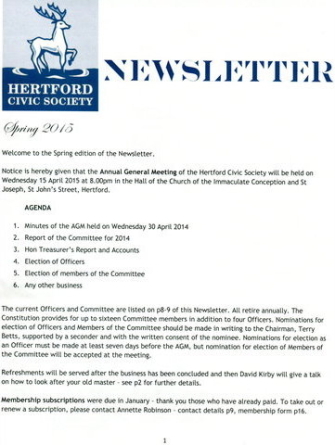 Alternatively you can consult the index of Newsletters by issue by clicking here.